It is natural monument of the whole island with 270 types of evergreen trees and 170 kinds of animals. It is also assigned for a part of Dadohaehaesang National Park. Hongdo Island tour is a cruise ship tour. It allows tourists to see the beautiful sea beside strange rocks and bizarre stones in Hongdo island. Cruise ship tour of Hongdo island has harmony of mysterious and beautiful scene of the see and Hongdo island. The sea of Hongdo island has uncontaminated areas of the sea which can clearly see 10meters underwater. And it also has a lot of finny tribes like abalone, sea cucumber, dome and see bass etc. Heuksando Island has unusual culture of banishment and island. The typical person of the banishment culture is Dasan Jeong Yak-Yong. And he trained foster students in Sachon-seodang village school. Heuksando Island has a circular road that can take you all the way around the island along the seashore. There are the peack of Sanglasan mountain, Jido rock and rock of south gate. Following this road, you can see almost all of the beautiful natural and cultural treasures of the island. And especially the peak of Sanglasan mountain is famous filming site for the sunrise and sunset. Doksilsan Mountain gives the mysterious feeling with the scene of long coastline, steep cliff and sea under the clouds. Hauido Island got interest Indongcho(Lonicera japonica) which symbolizes turmoil and complications. And it is home town of President Kim, Dae-jung. Last 1992, at the time of presidential election, many domestic and foreign reporters visitied his house in Hugwang-ri. And his house has also been recovered its original form till now. Hanuneom beach which is southern west beach of the Bigeumdo Island is the filming site of the KBS drama “Waltz of spring”. It is heart-shaped and romantic beach with the rumor which the beach makes couple complete the love between the viewer. And it makes beautiful scene cliffhanging precipice with rocks of fantastic shape, mountains, and islands. It is best place for the love propose and also for the recreation of family. U-ido Island has a beach with clear water and the fantastic sand dunes that you saw from Silk Road. By taking the ship (Shinhae No. 2) from Docho, arriving to Donmok ri (uido 2-gu), you will see Donmok beach with clear water and the fantastic sand dunes. Everyday, by the rains and the winds, the sand dunes take different shapes to show their natural beauty. They are as high as 80m and steep. Thus, it is not easy to climb them. However, if you make it and stand at the top of the dune, you can see the magnificent views of uido as a whole and it is just breathtaking. 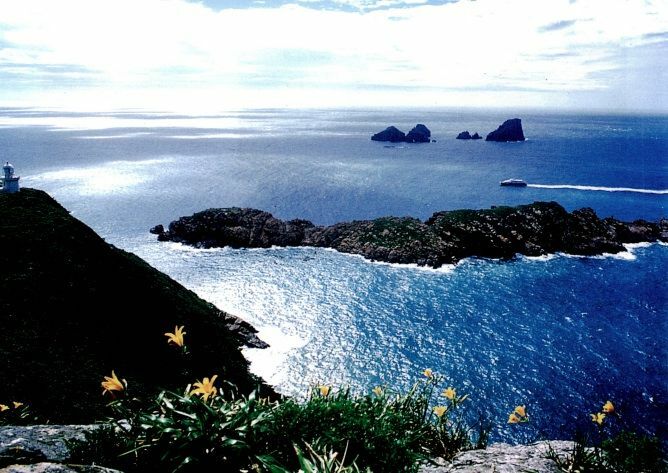 Stretches of rocky cliffs along the coast of the island are one of the magnificent scenaries of uido. Jeungdo designated as slow city has Taepyeong saltern, the largest salt production area as a single saltern in Korea. Saltern and farmland originated from Reclaimed land stretch in harmony. The slow city has the sun-dried salt produced naturally by the sun and the wind, eco-friendly agricultural/fishery products, unspoiled natural landscape and the unique culture of an island. Going through salterns for a while, you will see Ujeon beach in Ujeon ri. Its sandy beach is 4km long and 100m wide and the horizon with 90 or so uninhabited islands floating around is very beautiful. The clean water and the dense pine forest nearby attract many people in summer. North mud flat of Ujeon beach in Jeungdo Island has Tideland Culture and Eco Trail named “Jjangddungeodari Bridge”. In here, you can have an opportunity to experience firsthand the fresh germanium-rich mud flat, a habitat for mud skipper, long-legged octopus, clams, etc. The Imja Island Daekwang beach is 12km long and 300m wide. The horizon looking across the wide sandy beach is so lyrical and beautiful. Along with Myeongsashipri of Bigeumdo, Chupo of Amtaedo and Simok beach of Dochodo, it is listed as 4 grand beaches in Shinan. Daekwang beach is the longest beach in Korea and known for the vast and clean beach. 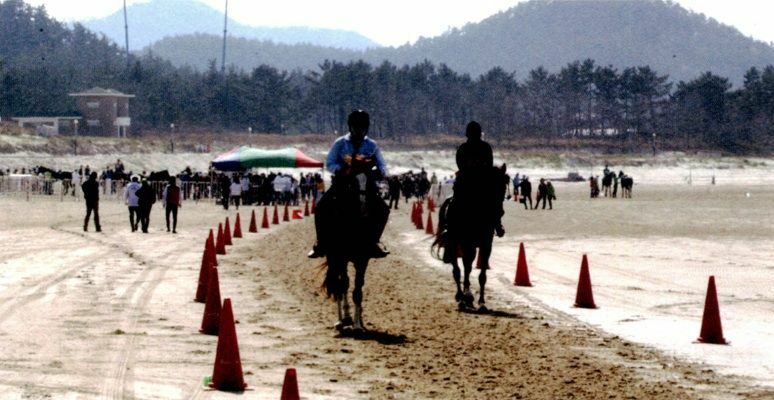 And there is a stamina horse-riding competition which is 5 km riding course with sandy beach, river side and obstacles. There are also some events like a photographic contest, free horse-riding experience for general tourist. At the back side of white sand, there is a dune with rugosa rose and black pine.